Following in the footsteps of Sean's project, a new seeker is searching for his passion. 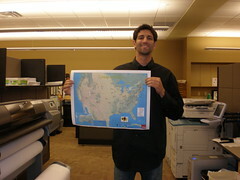 Daniel Seddiqui is crossing the US, sampling different careers and cultures, and blogging about the experience on his site Living The Map. The objective is to travel all 50 states to work 50 different careers in 50 weeks. Sound Crazy? I'm on a mission to explore various careers, environments, and cultures that America has to offer. I will explore the lifestyle that each state has to offer by choosing one career per state; a career that is popular and represents that state. While Sean's journey unrolled organically from week to week, Daniel has things a bit more prepared. He spent months leading up to his trip securing paid and non-paid positions (so far he's confirmed 35). He's also up-front about his desire to chronicle his adventure in a book. My inspiration to travel the country and work various careers comes from the people. Whenever I travel, I am intrigued where people live where they live and work where they work. Nothing is more appealing than the contrasts. Daniel is now in Week 6 of his career journey. So far he's worked in a Mormon temple in Utah, as a rodeo announcer in South Dakota, a hydrologist in Colorado, and a Cartographer in North Dakota. Congrats on taking the leap Dan! And best of luck on your journey.